Strange title for this painting I know. It looks fairly calm but there is a story behind this title. First, I am happy to finally post Wave Study #50! Half way through that first one hundred. We have been having lovely sunny weather the past few days. For the most part, it is a pleasure and those of us that live here do our best to enjoy these sunshine breaks as much as possible since the default weather here is wet and gray. There is a drawback for me personally. It creates all kinds of havoc while trying to paint on the beach. I painted this a couple of days ago. I went out right before high tide and there wasn't so much as a puff of air moving. Perfect! I could set up with my umbrella and enjoy the warmth of the sun. I was both optimistic and prudent and only brought one of my jackets and I stowed it with my pack higher up on the rocks. I got the sky painted in and about a half an hour after getting to the beach my senses alerted me that something was up. My head snapped up like a startled deer and I looked out at the water to see the evidence of a huge gust of wind about to hit me. I had time to grab and hold my umbrella and easel before it hit. Wow! It wasn't a hurricane force wind but it was pretty strong. I managed to get my umbrella down before it got any more damaged than it already is. I had to do everything while keeping a hand, foot, and hip on the easel to keep it from blowing down the beach. The wind slacked off a bit and I thought I could keep painting without the umbrella and all. I was wrong. It kept slamming into me stronger and stronger with each gust so that I was being blown around as much as the easel! I finally decided it was not going to work when the wind managed to get behind the canvas in spite of being somewhat protected in the painting box and smeared the paint on my brush all over the painting. The wind was painting as I was holding the brush still while trying to anchor everything to keep it from being blown to bits! I made it home just fine. I was glad I had my jacket as the temperature drops rapidly in the wind. It was much calmer the four blocks away from the beach where I live. I got enough of the painting in to finish it somewhat in the studio. 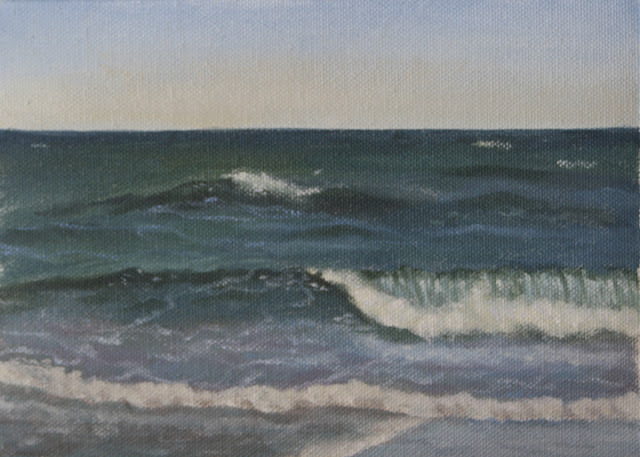 One of the disadvantages to painting on sunny days is the waves are usually rather disappointing. After checking the wind and surf charts, I decided not to go out and paint again until conditions change. They are changing today so we shall see what tomorrow brings. My new plein air system has arrived and I am conditioning the paint box with linseed oil. That will take a few days to get enough coats on. The backpack I ordered for it arrived today and I packed everything I usually take up and tried it on. It is lovely! It seems much lighter and the pack is very efficient with a lot of room and many pockets. I will take pictures on its first day in action. I will be getting that park pass on the first of May since the pass will be good for a year until the end of the month it was purchased in. 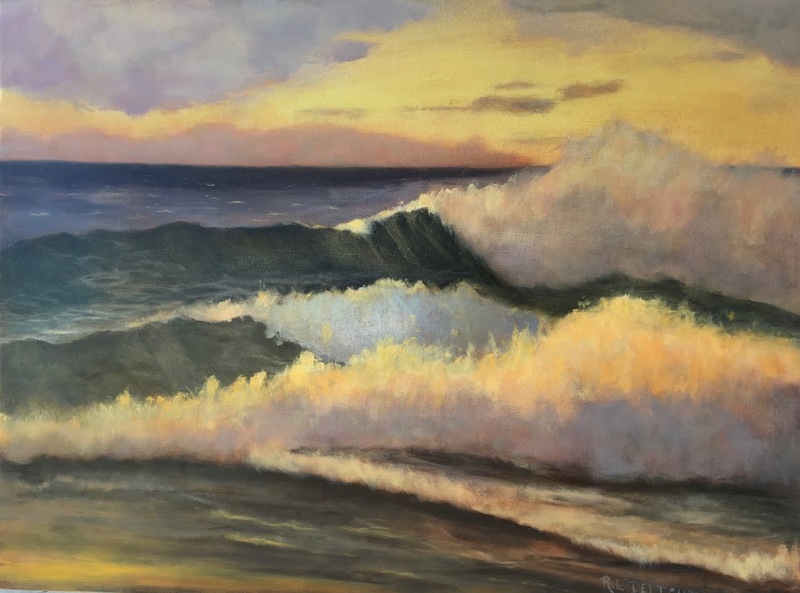 My plan is when conditions on the beach are like what they were the past few days, I will head over to one of the many nearby state parks and paint and the days when it is just too nasty to get out, I will work in the studio. I absolutely love what I do and am so excited to have found the joy of painting the sea and out of doors. I really love the challenge of building my skills and seeing evidence of my personal artistic growth. It is highly satisfying work in spite of being hard and very frustrating at times. I am so honored to have met and to continue to meet so many wonderful, interesting, creative people simply because I have chosen to become an artist. I have met so many teachers, new friends, artists that inspire, and fellow art lovers and creatives. I am truly humbled and am grateful to all who have reached out to encourage a total stranger to create her version of beauty. I post these here and also in my studio so that when those negative thoughts and feelings come crashing in I will be able to read these and remember the positive. So to all of you out there, what are three positive thoughts about what you do be it art, sewing, weaving, computer programming, or...? Feel free to share...or not but at least put some down for yourself. Now, getting ready to paint the second half of the hundred wave studies. The wind is so unpredictable! I was in Hawaii once (how nice) in a house with all the doors and windows open, as they can be there, when I heard a noise like a train coming towards me. A gust of wind just slammed through the house like a hammer, knocking over vases, scattering papers, swirling curtains. It was very dramatic, but problematic as well, and very sudden. You are clearly getting lots of experience with all kinds of weather. I hope your new plein air kit will serve you well. I will be thinking of positive statements, thanks for the suggestion.